With Valentine’s Day approaching, you may be looking for that special gift to get for your special someone. Unfortunately, pets can get themselves into trouble rather quickly by ingesting chocolate, different types of flowers, candies, and other things associated with Valentine’s Day. This special day is all about love and we know how much you love your pets. An emergency trip to your Veterinarian isn’t in your plans. Here are some Valentine’s Day dangers to avoid. Chocolate: Who doesn’t love chocolate? Chocolate is delicious and your dog probably thinks so too! Chocolate is a dose-dependent toxin. The amount and type of chocolate and your dog’s weight and general health status are all important in determining if he or she ingested enough to cause concern. While an M&M or two may not cause any harm, a chunk of baking chocolate from the counter may send your furry friend to the ER. In general ALL chocolates should be stored where your pet will not be tempted to help themselves. Chocolates can cause life threatening heart arrhythmias, gastrointestinal upset, seizure, and pancreatitis. If your pet has ingested chocolate, feel free to call us for an assessment of the risk. Xylitol: Xylitol is a sugar alcohol that is used as a sweetener in many types of candies, gums, and sugar-free items. Check that bag of Valentine’s candy. If it contains Xylitol, be very careful to keep it stored where your pet can not consume it. For pets, the ingestion of Xylitol can lead to life-threatening hypoglycemia (low blood sugar) and in some cases, liver failure. Flowers and plants: Many flowers and plants can cause gastrointestinal upset and oral irritation if ingested. While some flowers and greenery are harmless to pets, others are highly toxic if ingested. Some of the worst offenders are Lilies (kidney failure); Amaryllis (vomiting and depression); Oleander (heart arrhythmias); Sago Palms (liver failure). Lilies are very common in flower arrangements. There are many types of lilies; some are benign and some are dangerous. Peace, Peruvian, and Calla lilies are considered to be benign. If your pet were to chew/ ingest one of these types, you may notice clinical signs such as drooling, foaming at the mouth, irritation of the mouth and gums, and vomiting. True lilies (Lilium or Hemerocallis species) such as Tiger, Day, Easter, Japanese, Stargazer, Red, Western, Wood, Rubrum, and Asiatic hybrid are considered much more dangerous, and may result in kidney failure if ingested. You can look up a list of toxic plats/ flowers at www.aspca.org. Foreign Bodies: A pile of discarded wrapping paper and ribbon or a shiny pair of earrings may look like a fun toy to your pet. If ingested, these items can become logged in the gastrointestinal tract, leading to life threatening obstruction or perforations. Vomiting and loss of appetite are some of the first symptoms seen with GI obstruction. Alcohol: Be careful with those cocktails. Because animals are smaller than humans, a little bit of alcohol can do a lot of harm. Alcohol consumption can cause vomiting, diarrhea, lack of coordination, central nervous system depression, tremors, difficulty breathing, and metabolic disturbances. Potentially fatal respiratory failure can occur if a large amount is ingested. It is important to contact your Veterinarian immediately if you are concerned that your pet has ingested any of the items discussed above. Consider some Pet Friendly Valentine’s gifts to show your fur babies some love. A new collar, bed, or toy are great gifts for your pets. An extra walk, playtime, or extra cuddles won’t cost you anything and will be greatly appreciated by your pet. 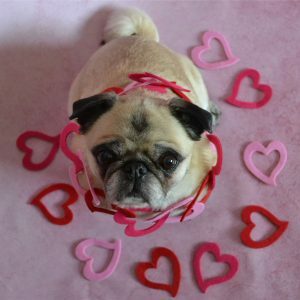 Happy Valentine’s Day from Prima Vista Animal Hospital!